Only 24% of UK students and 22% of US students felt they had enough resources to make an informed decision about overseas study. These top findings are among the results of over 10,800 responses from both countries that appear in “Broadening Horizons: Breaking through the barriers to overseas study“, the latest research report produced by Education Intelligence, the British Council’s global research arm. The enthusiasm to study abroad shown by the American students is surely a welcome sign, given that only a small proportion of US students pursue degrees overseas compared to other nations. As the 2012 Open Doors Report showed, about 14% of American students receiving Bachelor’s degrees this past year have studied abroad at some point during their undergraduate programmes, while only 1% of US students are studying abroad during a single academic year (273,996 out of the more than 20 million students enroled in US higher education). The main resources students in both countries relied on included internet research, teachers and lecturers, and international or study abroad offices. Student recruitment agents, more commonly used in traditional sending markets, were noticeably left off the list. This “info gap” echos findings from two reports ICEF Monitor reviewed last autumn based on survey responses from 4,000 freshmen at US-based institutions. Results showed that campus services were unable to meet student demand in the areas of career planning, study skills and financial guidance. In addition, difficulty accessing information was cited as a challenge for UK students interested in post-overseas-study work rights, according to another ICEF Monitor report from last year. It remains to be seen who will step in and give US and UK student services the boost it may well need. The British Council report indicates both academic and non-academic drivers for study abroad. The main academic motivations identified by students wanting to study overseas from both the US and the UK were similar: gaining credit for a current study programme and improving language skills. 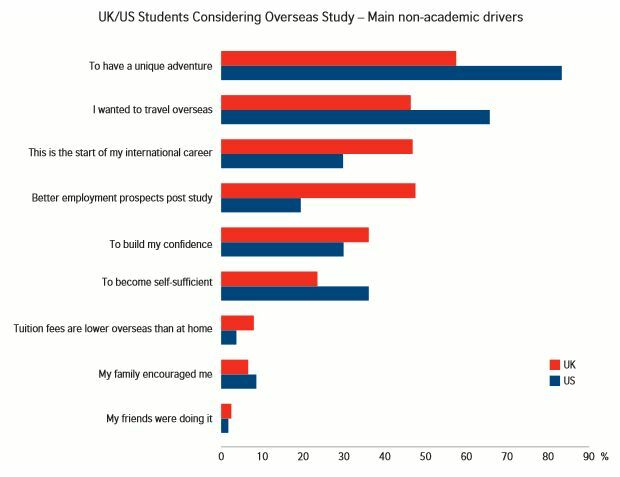 To a slightly greater extent than in the US, UK students indicated that they felt there were limited degree options at home and that study abroad was a way of widening their academic opportunities. Among US students, the report notes that there was a considerable difference in opinion between those contemplating studying abroad and those who were not or were undecided. Of those considering overseas study, 88% said they believed it would give them the edge they needed when applying for a job, compared to only 59% of those not considering or undecided. The attitudes US students are showing towards the reasons for study abroad appear to be in line with the US Department of Education’s (DOE) recently announced international strategy: “Succeeding Globally through International Education and Engagement”. According to the strategy, which aims to prepare American students to succeed in a globalised world, graduates face a unique set of challenges such as a highly competitive job market where students are competing with peers from around the world as well as needing to communicate and collaborate with people from other countries. Patti Peterson, American Council of Education (ACE) presidential advisor on internationalisation and global engagement, said the job market had changed, and that most big-name companies were looking for employees with a more global mindset. “They talk about wanting employees who are comfortable in multicultural teams, and working and interacting with staff in other countries,” she said. In order to achieve these results, the DOE aspires to equip US students with the skills to succeed in a multicultural environment by enhancing their understanding of other cultures, languages, and religions through travel and study abroad opportunities. those who are seeking a unique travelling experience. Which category people fall into often determines their study destination. Trends in destination choices for UK and US students were consistent, with two minor variations: the US top ten included South Korea and Ireland, whereas the UK top ten included Canada and the Netherlands. While 29% of UK respondents selected the US as their first-choice study destination, 22% of US respondents listed the UK as their first choice. Business, STEM subjects and foreign languages were popular fields of study for students from both nations. US demand is centred around the undergraduate level. UK students wanting to study abroad at the postgraduate level were mainly interested in an MBA and liberal arts, life science and social studies. Meanwhile US students at this level were more interested in law, computer and information technology, architecture, building and planning, agriculture and veterinary medicine. Financial concerns and a lack of information were the biggest barriers to studying overseas for all respondents, regardless of whether or not they had decided they wanted to study abroad. Other hesitations included language ability, difficulty leaving friends/family, safety abroad, cultural fit, ease of obtaining a visa, degree recognition and health care costs. For students who were not considering study abroad or were undecided, not surprisingly, help with funding was cited as a major factor which could potentially lead them to pursue a period of overseas study. Foreign language training and inspiring info sessions from study abroad alumni or instructors would also help to sway their opinions. This entry was posted in Europe, Higher Education, Language Learning, North America, Regions, Research, United Kingdom, United States, Work Abroad, Youth Trends and tagged tuition fees for international students, language learning, US visas, transnational education, backpackers marketing.